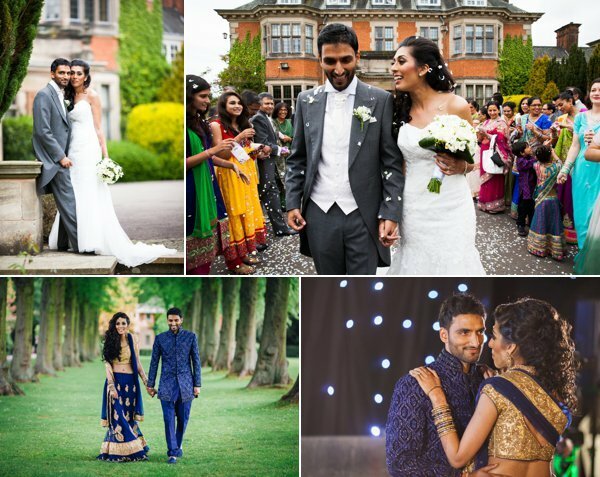 Hiten and Pooja married in Spring 2017 in a grand Hindu Wedding at Loughborough Grammar School, which was very fitting for their love of Harry Potter! When Pooja arrived to the venue we were able to sneak her away to capture some lovely bridal portraits. She wore a stunning traditional red and green bridal sari with matching accessories. Hiten and his guests arrived to the venue and the celebratory precession began with lots of dancing and singing along to dhol players. It was sure to be a lively and colourful wedding. Hiten made his entrance into the venue to begin the first part of the ceremony. Pooja then made her entrance and walked down the aisle. 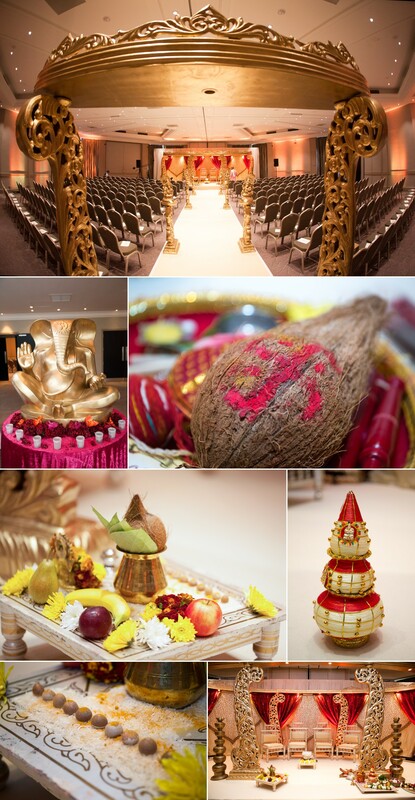 The Hindu ceremony began, the couple made their vows and took their 7 steps into marriage. Once the wedding ceremony had finished, guests made their way to grab some lunch while we took the couple away for some newly-wed portraits around the stunning grammar school grounds. It was a sunny afternoon and the blossom made for perfect Spring photographs. 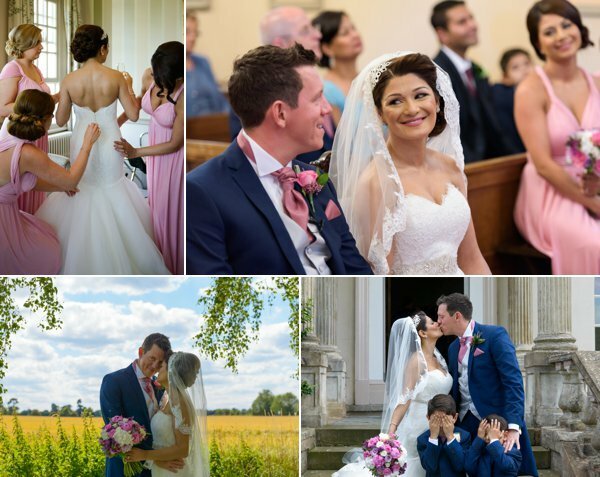 As the couple had planned for their reception party to be the following day, we had plenty of time to capture some beautiful footage and photographs. Once Hiten and Pooja had a little time to unwind and have some lunch it was time to say goodbye to their guests in a traditional Vidaai ceremony. Guests lined up while the Bride and Groom did their rounds of bidding farewell. The day, the couple headed to Domain Plaza in West Bromwich to celebrate their new married life. They had an awesome Marvel/Harry Potter novelty wedding cake and a huge “Mr & Mrs” light up display. Before the guests arrived we captured couple portraits around the inside of the venue. Pooja wore a navy blue indian party dress while Hiten opted for a navy suit to match his lovely wife. The guests entered the reception and the couple made their grand entrance to kick start their celebrations. They evening included a dance act by 3 younger guests and a jazz musical act by Pooja’s brother’s band. 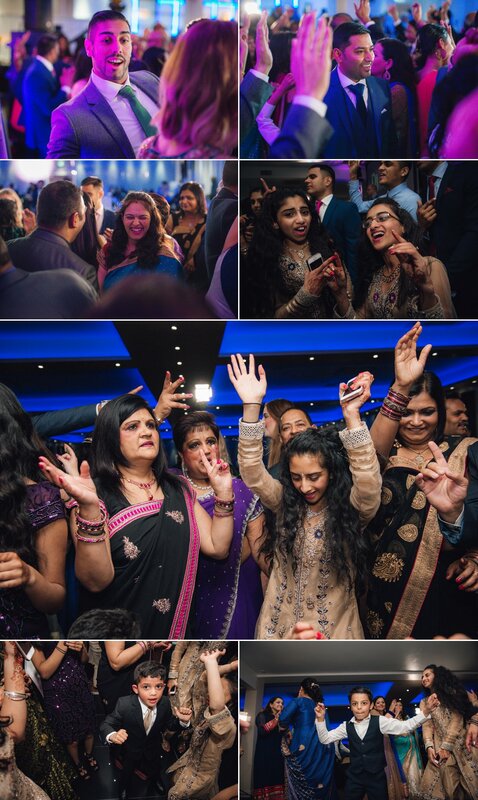 It was a fantastic lively party, we had so much fun capturing it. Congratulations once again Hiten and Pooja. Thank you for choosing the Finishing Touch to be part of your day! 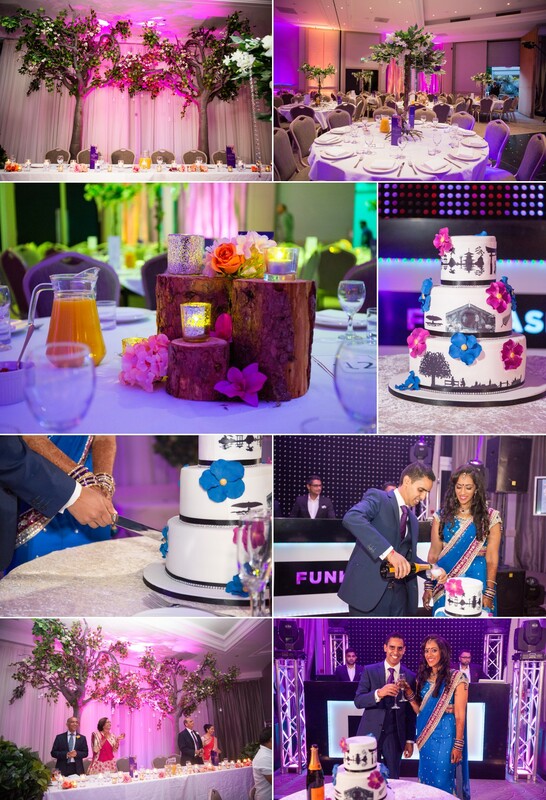 We had a jam-packed day for Alpesh and Nisha’s wedding celebrations. The couple tied the knot in a Civil Ceremony followed by a traditional Hindu Wedding Ceremony and Reception, which all took place at The Belfry Hotel in Sutton Coldfield. Nisha got ready in her hotel room, with the help of talented Jaineesha Make-Up and Hair Artist. 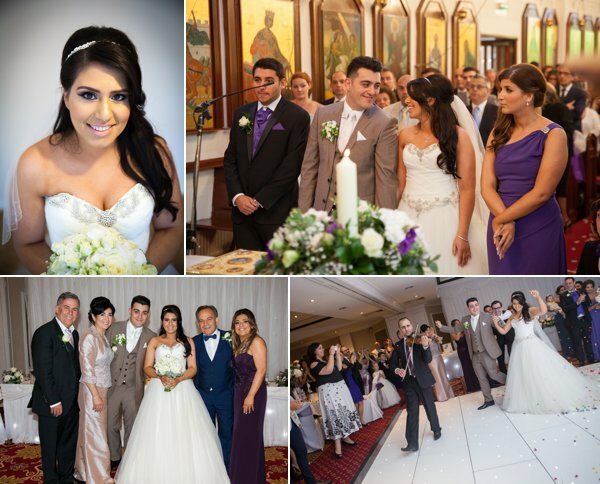 Nisha’s first outfit of the day was a stunning white wedding dress which she wore with her hair down with soft makeup for the civil ceremony. Once she was ready, she she made her way down to the foyer to surprise her husband- to- be in a “First Look” photoshoot followed by a couples photoshoot session and photographs of the couple with their close loved ones. Once the couple exchanged their vows and became an official married couple, they walked back down the aisle together and were showered with confetti. We were given access to the roof of the ceremony room… Yes… THE ROOF! where we were able to look down onto the wedding guests to capture the big group shot. Guests headed back inside to mingle, which gave our couple chance to sneak off to change into their traditional Indian wedding attire. Our lovely bride wore a beautiful off-white, red and green outfit with matching jewellery. 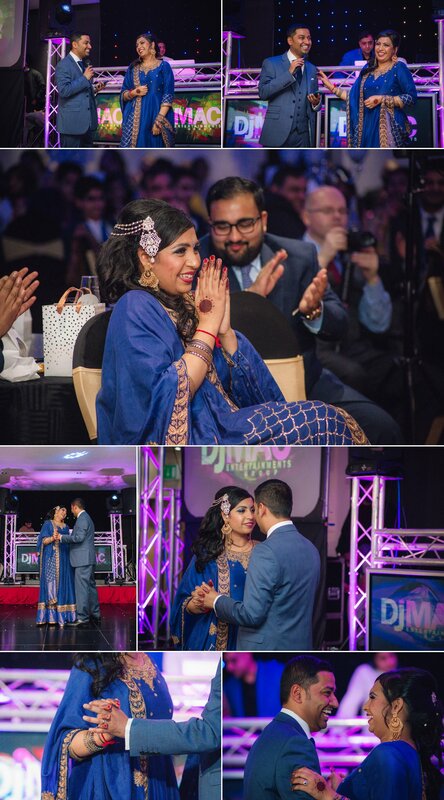 Jaineesha gave her a completely different look for the Indian ceremony . Once ready, we captured a few shots of Nisha with her new look before leaving her to have a few quiet minutes to herself. Meanwhile, Alpesh made his way to the wedding ceremony room. He’d changed into a traditional Sherwani for the Hindu ceremony. It was a tad rainy during the day but this didn’t stop our Groom and his nearest and dearest having a little dance outside to the beat of the Dhol player drumming away. Nisha entered the room and the Hindu ceremony began. The couple had some photographs taken with guests on the stage before they both headed off to get changed one last time for their reception party whilst their Guests were entertained with champagne. Once Alpesh and Nisha were ready for their reception, we took them out around the grounds of The Belfry to capture another couples photoshoot in their lovely 3rd outfits of the day. Luckily, the sun had come out just before sunset so we were able to capture beautifully lit photos outdoors with the hazy sun creating a stunning glow. The newlyweds entered their reception dancing through a crowed of cheering guests. We love it when our couples own their entrance! They headed straight to the dance floor to cut their wedding cake before sitting down at the top-table to hear speeches from their nearest and dearest. The couple took centre stage for their first dance as Mr and Mrs. They surprised guests with a choreographed routine halfway through their first dance which was lovely to capture. This officially opened the dance floor for guests to join them and what a crazy party it was, full of energy and laughter and we had so much fun staying till the end. We would like to wish the newlyweds a magical married journey and want to thank you for choosing us to be part of your special day.